Traffic Quiz For You! « Being The Safe Driver! Behind The Wheel! Which Car Goes First? And Why? Test Your Driving Skills and Knowledge here! Car number 2 goes first because he has the right of way. Car 3 goes next because he is on a major road and does not have any yield sign. Car 1 has a yield sign and must wait until all the traffic in front is clear. 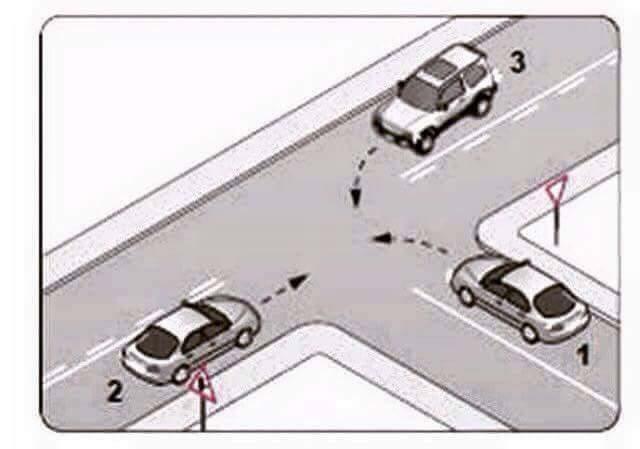 (Just a note, some people think Car 2 has a yield sign. That is not a yield sign. That is a road information sign that can be used to indicate that caution needs to be taken and/or that there is a junction up ahead. It does not tell the car to stop or yield, just to be cautious that there may be cars turning on or off the main road).